Ginza Holiday found its beginning in 1956. 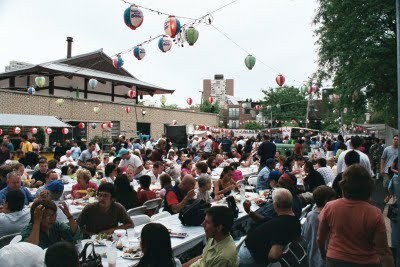 […] The event serves two purposes; one as a fund raiser to meet the temple expenses and the other as a way of sharing Japanese traditions with the people of the neighborhood. […] The first event proceeded with some apprehension as it intended to draw upon the non-Japanese community. Most members harbored unfavorable experiences in the decade preceding. Uprooted from the West Coast to isolated camps, they made their final trek to Chicago on news of jobs and friendlier surroundings. The dread of non-acceptance ran deep. The optimists among them proved right as fears were totally unwarranted. The good neighbors of Chicago attended in droves. Teriyaki chicken became an instant success. An old family recipe surely helped. To the consternation of a few, it may have eclipsed some of the cultural events. These bazaars endure as a testament to the vitality of the Japanese American spirit and the temples’ longstanding openness to reach out to the local community. If you’re in Chicago or Sacramento and enjoy whiling your time kvetching about “insular Asian Buddhists”—please visit your local bazaar, grab some lunch or dinner and then leave me a comment to relate these temples’ insufferable refusal to be involved in the greater community! Photo courtesy of Ginza Chicago.